The Polish Accreditation Committee granted a distinguishing mark to the field of fishery at the Faculty of Environmental Sciences of the University of Warmia and Mazury. This grade will be valid for 6 years. The Olsztyn field of fishery is one of the three fields of this kind in Poland and one of the oldest fields of studies at the University of Warmia and Mazury (UWM). It was created 70 years ago. The dean’s office of the Faculty of Environmental Sciences hopes that the distinguishing mark for fishery will encourage a larger number of secondary school graduates to take up studies in this field. - ‘In its justification of the distinguishing mark for fishery, the Board of the Polish Accreditation Committee stressed that all criteria of evaluation were met very successfully by us. We were checked very thoroughly. The PAC had a good opinion of our classes – particularly of the fact that teachers used the results of their research as a basis, thus sharing most recent knowledge with students. 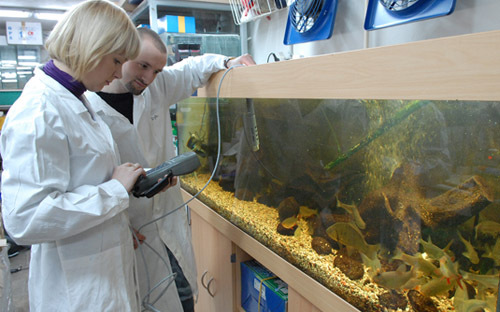 ‘The Committee expressed recognition and admiration also for the equipment of our laboratories in the Centre for Aquaculture and Ecological Engineering and the Centre for Biotechnology,' says Professor Mirosław Krzemieniewski, the dean of the faculty. Professor Ryszard Górecki, the rector of the UWM, emphasises that the distinguishing mark for fishery is also a result of the good functioning of an internal education quality assurance system at the university. Scientists from Hokkaido University expressed their will to co-operate with the Faculty of Environmental Sciences and to support the field of fishery in our country,’ stresses the rector. - ‘Another advantage of the distinguishing mark for the faculty is the opportunity to apply for a large amount of financial aid, even up to 1 million PLN,' adds Górecki. In the upcoming academic year, the faculty wants to introduce the environmental biotechnology specialisation in English in master’s studies in the field of environmental engineering; there is also a plan to introduce the fishery and aquaculture specialisation in English in the field of fishery in the next academic year.